The words you use to reference that fish matter. This is just a very, very quick post, as I am presently in the thick of #ir14—the 14th Annual Conference of the Association of Internet Researchers (AoIR). It’s my first time at IR, and so far I’m really enjoying it. The keynote, preconference workshops, plenaries, and sessions I’ve attended have been great, and the hashtag-stream quality is high (there are some talented livetweeters here, and plenty of hashtag socialization too). Since it’s not a disciplinary conference, everyone is here because they really want to be here—which you can feel in the general atmosphere, and which makes such a difference. From my barely-informed new member perspective, it really does seem as though AoIR has managed to roll a thought-provoking academic conference and a fun reunion party into one four-day long event (which, as a Theorizing the Web committee member, is obviously a project near and dear to my heart). TL;DR: #ir14, I love you. And I’m bringing attention to the following critique not to be a jerk, but because I think you’re great and I know you—we—can do better. 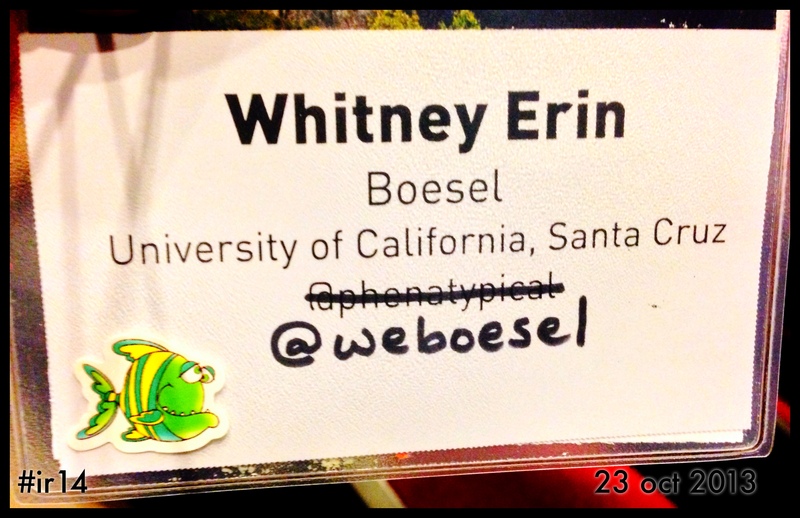 When I picked up my conference badge yesterday during the break between preconference workshops, there were two things I noticed about it. The first was that it came pre-printed with my Twitter handle—yay! I love when conferences do that (even if I had to edit mine, because I registered for #ir14 before I changed my Twitter username). The second was that there was a sticker on it, a little cartoon fish. “What’s the sticker for?” I asked the volunteers at the registration table. One of them speculated that it had something to do with meal preferences for the closing banquet (perhaps the fish’s greenness indicated that I’m vegetarian? ), and the other said the meaning of the stickers would be explained later. Okay, that’s cool—I like fish. That afternoon, someone in my second preconference workshop (who is not a first-time attendee) speculated that the stickers would have something to do with some kind of “forced socialization”—though she wasn’t sure what. Some of us joked about different ways to hack the exercise, whatever it might turn out to be. 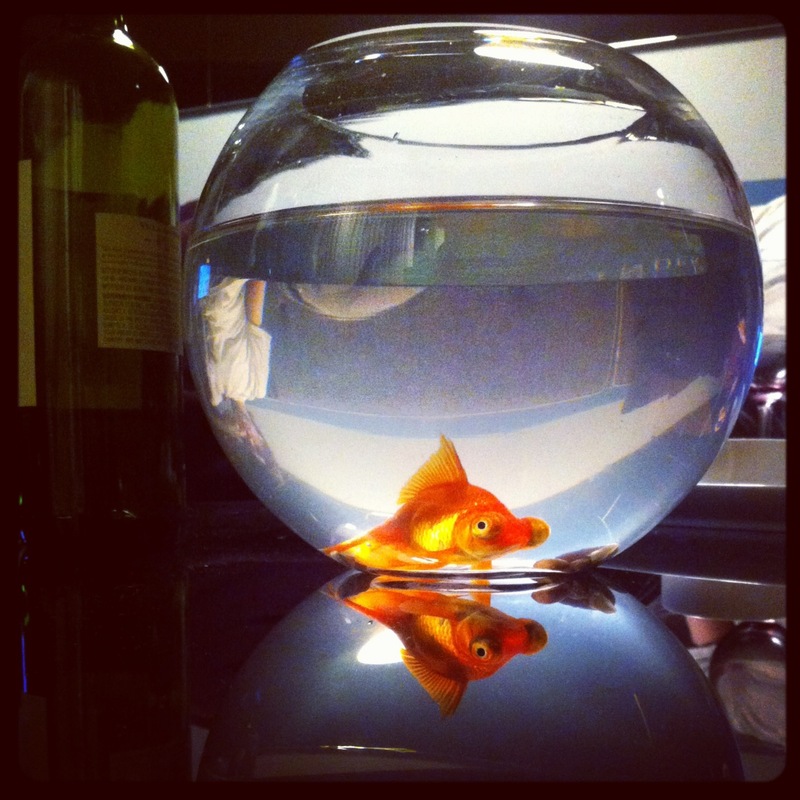 That’s (one of) my fish. Screeeeeeeeeeeech, went the vinyl record in my head. A lot of the room was laughing, but I felt distinctly uncomfortable; I’d been under the impression that “spirit animal” isn’t a term to toss around lightly. Sure, I’ve long seen it used in dumb Internet quizzes and on sarcastic bumper stickers and in flippant everyday speech, but the “spirit animal” concept also holds significant meaning for some Native American cultures and for shamanic religions. The theme of #ir14 is “Resistance + Appropriation”; shouldn’t we maybe not further the appropriation of marginalized groups’ cultures by appropriating parts of those cultures ourselves? RE: Spirit Animal @ #ir14 -Think I’ll throw a conference where people wear fun, stylized foam nails that you put thru your hands. By the time I got on the wireless at the plenaries this morning, however, the issue had been raised again—this time by two of my Cyborgology colleagues who, though not at #ir14 in person, had been following the conference hashtag and wondered what was going on with use of the term “spirit animal.” I was relieved to see my friends chiming in, and to see the subsequent conversation persist a while on the hashtag: Ok, maybe now we here at #ir14 would return to the issue. The hashtag conversation was taking place during the “Race, Gender, and Information Technologies” plenary; surely there was no way our collective appropriation of “spirit animal” would go unaddressed. It’s gone almost entirely unaddressed. I did see a few attendees acknowledge that “spirit animal” had not been an appropriate choice of words; later in the day, one attendee tweeted a link to a good explanation of why “spirit animal” was not the term we should be using to reference our funny nametag-dwelling sticker creatures. But…so far, that’s been it. And to be honest, that saddens me. It’s tempting to say that maybe this was just a slip, that perhaps the organizer who explained the game unintentionally chose a less-than-appropriate term in the moment of making the announcement (perhaps under the pressure of public speaking); still, that isn’t what it sounded like. And what’s more troubling than one announcement is the fact that so many conference attendees adopted the appropriative language and reproduced it, without stopping to think about the ramifications of doing so. Although I’m thankful that no one has spoken up on the hashtag to defend the use of “spirit animal” at #ir14, I’m also saddened that no one has stepped up to apologize for using it, or to ask people to use a different term. Say what you will about name badge sticker networking games; to me, the game is quirky and silly in a way that fits with the overall character and culture of #ir14. But choosing the term “spirit animal” to describe the sticker creatures on our name badges was insensitive and inappropriate, and particularly unfortunate given the conference theme. That usage was definitely an act of appropriation, and there has been some initial resistance; I’m still waiting to see what happens next. AoIR, I have faith in you. We’ve spent the day rejoicing in the gender equity of the #ir14 speaker lineup, and in women’s strong intellectual presence within AoIR generally; we expressed our gratitude and appreciation for a plenary that so explicitly addressed both race and racism online. The social-justice acumen here is obviously well above average. So can we maybe stop and reflect a little about the language we’ve been using for the last ~28 hours? I know the theme is “resistance + appropriation,” but let’s not delve into that by making our conference a case study. I know we can do better. The International Sunbelt Social Network conference has the same serious/fun spirit and size. But we meet in warm weather in the winter. This year, St Pete Beach near Tampa. Late Feb as I recall. www.insna.org has the details. PS: Totally agree with your spirit animal critique. Thanks for pointing it out. I wrote a long respons to why I don't think this should be taken so seriously, referencing my own ethnic background (the granddaughter and niece of two shamans). Then I realised I was taking this way too seriously. Among the sami (with a rich spirit world populated by animals), laughter and double meaning is a major part of the culture, and they would have laughed their wise and wonderful heads off at the idea of righteous offense in either direction. So please, when you seriously tell us how to feel about spirit animals, remember to laugh. Wonderful critique, and I agree -- great idea, poor choice to appropriate the term. I wonder how to appropriately reflect in the moment. Seems like difficult (but important) work, but I'm not entirely sure where to begin. I agree, they did not think that one out. Now I'm wondering what other appropriation was possibly present? Twerking? The problem with this critique is the "ownership" of the term to Native Americans or even shaman-religions. It is other cultures that use the spirit animal metaphor without the Western-centered ideology. This is a very narrow view of the term. I disagree that the description as this term is an appropriation of the term is Native American concept of the construction. The tumblr post listed is a version of the construction. This is a fundamentally different discussion than the use of Native American as mascots. They are the bastardization of the standard symbols of the a group and community of people that are oppressed on a regular basis. When I heard the term "spirit animal" to the sticker on the badge, I thought it was an "artifactual avatar" embedded on top of the badge. To me, it was a piece of meta-data. The bigger question that was not addressed in this dialogue is "does one culture own the right to a lexicon of terms?" I do not know the answer to this question. Also, I realize this could be wrong. However if the answer to this question is "yes," there are deeper issues that needed to be addressed. Noticed right away. Xojane had a nice article about anti indigenous messages and appropriation in this vein. Didn't say anything but should have. Our first plenary was on race after all so I don't see this as systemic, but more as unfortunate slip. I agree entirely. And to be fair, I don't know that it was representative of AoIR as much as it was representative of my own lack of thinking. Twitter aside, I bear a particular responsibility when I have command of a microphone and the stage. I find myself in front of groups with more Native American representation (most of my classes at ASU) and have worked--at least to some extent--on issues directly related native communities with my grad students. Why, off the cuff, I felt it was acceptable to label our stickers this way I can't say for certain. And so that poor choice on my part and a clear appropriation was unacceptable. I made equal use of blaspheming a dominant religious practice, but I fully recognize this is not the same thing. And, in case it is not perfectly clear from the above, I am sorry I said it. Oh, and as a quick follow-up--it was indeed a slip-of-the-tongue. In neither my proposal nor in any of our discussions did we use the term. Nor would I have if we had ended up with robot stickers (which it looked like we might have) or had I known half the stickers were not animals at all. Like almost everything I say in front of an audience, it was unrehearsed. Had it come up before, with more time, I suspect I would have caught myself before anyone else had to catch me. None of which excuses the error. Torill's comment above points to another issue - the term isn't "owned" by Native Americans but is something common to many cultures, including the Sami people! who might have had a quite different response to Whitney's. Isn't there a danger - an implicit racism - in trying hard NOT to appropriate from indigenous cultures?